Children with parents in the military have higher blood pressure, heart rates and general stress levels than their peers during wartime, researchers say. Researchers looked at 121 adolescents – including 48 with civilian parents, 20 with a parent deployed to Iraq and 53 with a parent in the military but not deployed – days after Operation Iraqi Freedom was launched in March 2003 and nearly three months later when President Bush announced major hostilities had ceased. At both points, adolescent offspring of military personnel self-reported higher levels of stress and measures of blood pressure and heart rates supported that. “We expected stress levels would push up blood pressure and heart rates,” says Dr. Vernon Barnes, physiologist at the Medical College of Georgia and principal author of a paper published in the January issue of Military Medicine. 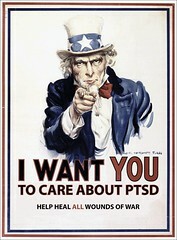 Dr. Barnes and his colleagues used a posttraumatic stress disorder questionnaire developed by the military for personnel and modified for adolescents, a survey to assess psychosocial concerns such as sense of well-being and faith in government as well as more objective heart rate and blood pressure measures. Not surprisingly, they found that particularly adolescents with deployed parents had higher rates than their classmates. Studies were done at the Academy of Richmond County, a high school in Augusta, Ga., attended by many children whose parents are stationed at Fort Gordon.